Franciscan Sr. Pat Farrell and three other sisters crossed St. Peter's Square through the fabled white columns, paused for a security check and entered the rust-colored Palace of the Holy Office. It was April 18, 2012, and on entering the palazzo, they were aware of its history, that in this same building nearly 400 years earlier Galileo had been condemned as a heretic by the Roman Inquisition for arguing that the Earth orbits around the sun. Today, the palazzo houses the Congregation for the Doctrine of the Faith, the Vatican office that enforces adherence to church teaching. As president of the Leadership Conference of Women Religious, Farrell and her executive colleagues had an appointment with the prefect, Cardinal William Levada, about the congregation's investigation of their group. They were walking into what Fr. Hans Küng, the internationally renowned theologian who has had his own battles in the palazzo, calls "a new Inquisition." The sisters were accused of undermining church moral teaching by promoting "radical feminist themes incompatible with the Catholic faith." To many sisters, the congregation's action is a turn toward the past, causing a climate of fear and a chill wind reaching into their lives. The Vatican wants control of LCWR, an association of 1,500 superiors, representing 80 percent of American sisters, most long active in the front lines of social justice. The main leadership council of American sisters embraced the Second Vatican Council's social justice Gospel, which has taken sisters to some of the poorest corners of the world to work with politically oppressed people, particularly in Latin America. But a stark drama of attrition has unfolded as the Vatican II generation reaches an eclipse. Since 1965, the number of American sisters has dropped by more than two-thirds, from 181,241 to 54,000 today. The Vatican crackdown of LCWR has exposed a schizophrenic church. Interviews with missionary sisters in Rome, from India and other countries, register a deep fault line between cardinals immune from punishment, and sisters who work in poor regions with some of the world's most beleaguered people. Religious sisters from other parts of the world view LCWR's conflict with foreboding. How far Pope Benedict XVI goes in imposing a disciplinary culture, policing obedience over sisters, is an urgent issue to many of these women -- and one sure to color this pope's place in history. The doctrinal assessment delivered by Levada was an intervention plan; he appointed Archbishop J. Peter Sartain of Seattle to approve speakers for LCWR gatherings and overhaul its statutes. "You can impose silence, but that doesn't change anyone's thinking," Farrell reflected several months later at the convent in Dubuque, Iowa, where she lives. "This is about the Vatican II church, how we have come to live collegially with participatory decision-making," Farrell said. "When I entered in 1965 we studied and prayed with [the Vatican II] documents, implementing new charters. ... We're in a line of continuity with the early history of our communities, assessing unmet needs, going to the margins to help the homeless, people with AIDS, victims of torture and sexual trafficking." "When Vatican II requested nuns to search their history, Rome believed in a mythology of plaster statue women," said Syracuse University Professor Margaret Susan Thompson, a historian of women religious. "They found instead nuns who took the job literally, and became controversial for doing so." The leadership conference endorsed women's ordination in 1977 -- 17 years before Pope John Paul II reinforced the church's ban on it with the apostolic letter Ordinatio Sacerdotalis. Farrell says LCWR has not campaigned for women's ordination. Nor has it endorsed abortion. The doctrinal congregation's demand that the leaders speak out against abortion and gay rights is a battle over conscience, forcing words into superiors' mouths. "These women are really rooted in Christ and committed to the poor," said Sr. Nzenzili Lucie Mboma, executive director of Service of Documentation and Study on Global Mission in Rome. A Congolese member of the Franciscan Missionaries of Mary, Mboma had two friends murdered in political violence in the 1960s, during her novice years. "It is painful to see the Vatican carrying on these kinds of things," she said. "In certain parts of the church we have an us-versus-them mentality," said Fr. Míceál O'Neill, an Irish Carmelite prior in Rome with background as a missionary in Peru. " 'Us' is religious, and 'them' is officers of the Holy See." "We have a church that is doctrinally conservative and pastorally liberal," O'Neill said. "The Vatican is trying to assert control, 'we are in charge.' ... Many people are saying the two churches are not coming together." Farrell, 65, came of age in Iowa in the years of Vatican II. She joined the Franciscans at 18, and in her 30s worked with Mexicans in San Antonio. She moved to Chile in 1980 during the dictatorship of Augusto Pinochet. Disappearances were common. "It was routine for police to torture people in the first 72 hours," she said. Demonstrations were banned, yet protests were the only way to put a spotlight on abductions when lives were at stake. She joined "lightning demonstrations," unfurling banners of the anti-torture protest movement in congested traffic, spreading leaflets that gave people information on the missing, who were airbrushed out of news reports. At one point she was arrested, with 100 other people, but coverage in a growing clandestine media saw them released the same day. In 1986, she moved to El Salvador with a handful of sisters to help people reeling from a civil war with U.S. military support of the Salvadoran government. Farrell spent her first weeks sleeping at night in a church sacristy, getting to know people, and eventually moving into a sprawling refugee camp, living with villagers displaced by military bombings. American sisters were a nonviolent presence, giving thin cover to locals. "We learned never to leave the road because any area off defined footpaths could have land mines," she explained. "I remember walking down one long hill with trembling knees to meet a group of soldiers who entered the camp. Part of our role as internationals in the camp was to keep the military out and I was on my way down to ask them to leave. That time they did, thank God." Religious processions common to Latin America took on heightened meaning. For a newly repopulated community to show up en masse, with banners of saints and the Virgin Mary, conveyed "a political statement," Farrell said: "We are not afraid. We have a right to be here. Our faith continues to be a source of strength to us." In 2005, Farrell returned to her Dubuque convent. Elected to the LCWR board several years later, she was midway through her one-year term as president when LCWR leaders made their annual trip to Rome in 2012 to update church officials on their work. With Farrell were Dominican Sr. Mary Hughes, past president; president-elect Franciscan Sr. Florence Deacon, and Janet Mock, the executive director and a Sister of St. Joseph of Baden, Pa. The sisters had met once with the doctrinal congregation's investigator, Bishop Leonard Blair of Toledo, Ohio, but had not seen his report. The sisters were expecting some conclusion to Blair's inquiry but had no indication about what it would entail. Blair was not in the meeting that day. They were to meet with Levada, who was about to turn 76 and retire to his native California. After a cordial greeting, Levada read aloud an eight-page, single-spaced assessment that his office was just posting to the Internet. The assessment accused the sisters of "corporate dissent" on homosexuality and failure to speak out on abortion. The assessment also castigated LCWR for ties to NETWORK, a Washington-based Catholic lobbying group that supported the Affordable Care Act, and the Resource Center for Religious Institutes, a group in Silver Spring, Md., that gives religious orders canon law guidance on property issues. Leaving the Holy Office, Farrell felt numb. "It was in the press before we had time to brief our members," she recalled. "The reaction of rank-and-file sisters was anger. Now there is a stage of deep sadness and concern for the climate in the church and the misrepresentation of religious life," she said. A darkly ironic twist involves the doctrinal congregation's handling of the clerical sexual abuse crisis. The congregation has processed 3,000 cases of priests who have been laicized for abusing youngsters. Several hundred are reportedly pending. Yet those procedures, which Benedict, as Cardinal Joseph Ratzinger, put in place as prefect in 2001, have a large loophole. The office has not judged bishops and cardinals whose negligence in recycling abusers caused the crisis. The most glaring example is Cardinal Bernard Law, whose soft-glove treatment of pedophiles ignited the Boston scandal. He resigned as archbishop in 2002 and in 2004 he was named pastor of a great Roman basilica, Santa Maria Maggiore, with a $10,000 per month salary and a highly influential role in choosing new American bishops. Law was a driving force behind a preliminary investigation of all American religious orders of women, according to several sources interviewed here, and a May 15 report by Robert Mickens, the respected Vatican correspondent for the British Catholic weekly, The Tablet. Law, who has not spoken to the media in a decade, refused an interview request. But Cardinal Franc Rodé, 78, retired prefect of the congregation that oversees religious orders, confirmed Law's role. In a wide-ranging interview at his residence in the Palace of the Holy Office, Rodé said, "It was the American milieu in the Roman Curia that suggested it." 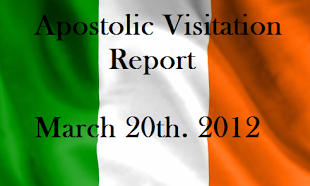 The "apostolic visitation" of all but the cloistered communities of U.S. women religious was the initial phase. The doctrinal congregation's aggressive investigation of the main leadership group soon followed. "Some people say this is an attempt to divert attention from the abuse crisis, like politicians do," a missionary sister from a developing country with her order in Rome, said of the doctrinal congregation's investigation. She asked that her name not be used because the order depends on donations from U.S. Catholics channeled through dioceses. "The Vatican is trying to assert control, to say, 'We are in charge,' " she continued. "This envisions a different church from Vatican II. Many people are saying that the two churches are not coming together." LCWR has indeed pushed the envelope by giving forums to theologians who have questioned celibacy and the evolution of religious life. As liberal theologians clamor for change, LCWR has collided with the doctrinal office over freedom of conscience, a core principle of Vatican II. Rodé, as prefect of the Congregation for Institutes of Consecrated Life and Societies of Apostolic Life, ordered the 2009 visitation of American sister communities. He told Vatican Radio of his concern for "a certain secular mentality … in these religious families and perhaps also a certain 'feminist' spirit." Rodé was also prompted by a 2008 conference he attended on religious life at Stonehill College near Boston. Dominican Sr. Elizabeth McDonough, a canon lawyer, accused LCWR of creating "global-feminist-operated business corporations" and "controlling all structures and resources." "I'm unaware of any such facts that would back up that claim. It sounds like a sweeping indictment of the direction many orders have taken which the hierarchy found offensive or disloyal, summed up in the 'radical feminism' catch phrase," said Kenneth A. Briggs, author of Double Crossed: Uncovering the Catholic Church's Betrayal of American Nuns. "Most orders were scrounging to come up with funds to support retired sisters, often selling off property that belonged to them to do so. It seems clear to me that the aim of the Stonehill meeting was to paint a picture of disobedience as a pretext for a crackdown," Briggs said. Rodé in an interview brushed off suggestions that the apostolic visitation was unfair. Rodé had requested $1.3 million from religious communities and bishops to cover travel and other expenses for the visitation, which he appointed Mother Mary Clare Millea, superior general of Apostles of the Sacred Heart of Jesus, to carry out. The funding request raised eyebrows among many missionary orders. "Why would you want to pay them to investigate you?" asked one of the missionary sisters in Rome. The study by Millea has not been made public. "Vatican II was the most important event that changed the Catholic church," said Sr. Nzenzili Lucie Mboma. "Jesus was a carpenter. He didn't build cells, but windows to see every culture." She paused. "Why is this investigation happening?"